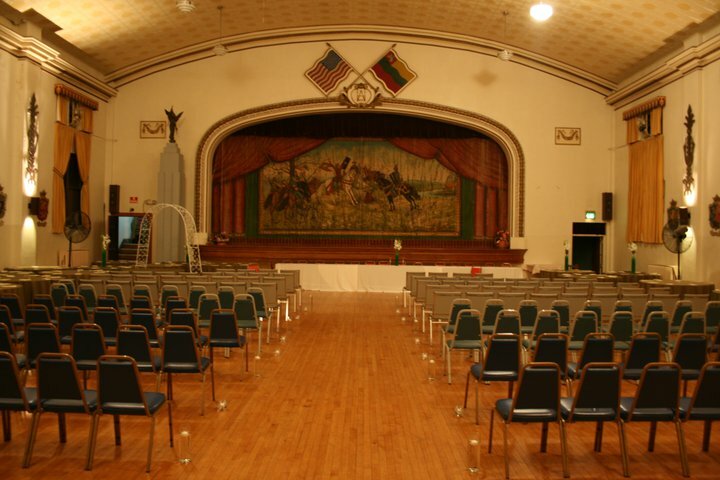 The Lithuanian Hall offers a unique setting for hosting any type of event, from large wedding receptions to small-scale business meetings. We have three beautiful spaces to choose from and can accommodate up to 485 guests on both floors. We also offer custom catering and event decor services. The Main Hall of the Lithuanian Hall is truly impressive! It will seat up to 385 guests while allowing ample room for dancing. The main hall has a stage and a bar in the back corner, and is ideal for shows or large weddings. Though it seats 385 people for a concert, you can easily seat up to 200-220 people at round tables with 8-9 people per table. The rental cost is $200/ hour with a 6 hour minimum Rent the Main Hall for a wedding, theater production, fashion show, or office holiday party... the possibilities are endless! The downstairs Maple Room provides a welcoming atmosphere for small events, from business meetings to baby showers and birthday parties! Our commercial kitchen may be rented as well for all your catering needs. This room seats up to 100 people with approximately 8-9 per table. The rental cost is $100/ hour with a 6 hour minimum. The Dining Room next to the bar is also available if the Maple Room is not large enough, or you are looking to book an event that will include both venues. The kitchen is available to rent for caterers or chefs who may have a special occasion planned. The game room includes a pool table and children’s games, and is a great place to leave the kids while the adults use the Maple room. 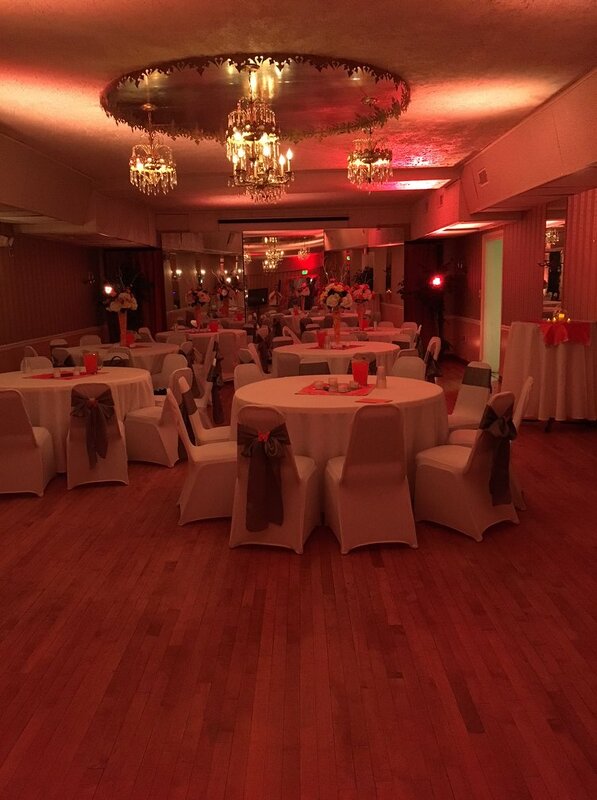 Check with the manager for availability (410-685-5787 or rentals@lithuanianhall.com). Book early as many weekends are already taken. Events may not go beyond 11:00PM. Tables, chairs, trash cans, trash bags. We do not provide linens or decorations. Your own alcohol, food (just to serve, not to sell). The Lithuanian Hall is located at 851 Hollins St. near downtown Baltimore, only one block from Martin Luther King Jr. Blvd. and I395. It is easy to get to from the suburbs or even Washington DC or Philadelphia, if you have out of town guests driving to Baltimore. And it’s just 15 minutes to BWI airport. Limited residential street parking is available, but we recommend patrons use the Biopark public garage located at 1 North Poppleton Street (at the corner of W. Baltimore and Poppleton Streets), $12 max. daily rate. The Biopark garage is about a 2 1/2 block walk from the Baltimore St. entrance of the garage, to the Lithuanian Hall. Many of our guests prefer to use ride sharing services like Uber or Lyft for easy dropoff or pickup. The Lithuanian Hall is open every Friday from 4-8pm. and you are welcome to stop by and see the rental rooms. Otherwise, call the manager at 410-685-5787 to set an appointment to see the Hall. Feel free to call for any additional questions.